These days, we tend to consider boredom as a kind of disease, something that we have to avoid at any cost. It is common to hear phrases like: “boredom is the mother of all vices.” Boredom is the result of “having too much free time,” therefore being bored is being lazy, unproductive, indifferent. “There is so much to do, to explore, to know, to see… how is it possible that you can be bored? If you are busy, you can’t be bored.” So, we must keep ourselves busy, fill up our agendas with activities and accept almost any job offer that gives us the sense of being useful and appreciated. Therefore, we tend to be highly productive, as if it were the one way to have meaning — to have a life with purpose. On the other hand, there are numerous possibilities to escape from the menace of boredom. We have many different options to amuse ourselves. We have places specifically designed to offer us entertainment, pleasure, and amusement. We can buy almost anything we want to run away from the dangers of boredom. Despite a variety of options to keep ourselves busy, we are a bored society. A society that does not know what to do with itself. A society that is constantly looking for routes to escape and avoid seeing itself. A society that is constantly looking for almost any kind of entertainment that offers a pleasant way to close the eyes and avoid the reality and its problems. Therefore, the question is this: what would we do to avoid boredom? What would be the boundary to escape from the routine, the familiar faces, the well-known places we tend to visit? What would we do if we can choose to leave everything behind and start again? What would we do if someone offer us the possibility to live in a new city, with new people, in a place so big, that no one recognizes us, in a place where we can be completely free? Shall we be able to restrict ourselves if we have this chance? We could affirm that the main reason Sofia — the protagonist of Sueños rotos: Sofía from H.G. Santarriaga — escaped from home with a stranger was boredom. However, it is necessarily more that tedium to drive someone to run away from friends, family, and the safety of home. We could affirm that it was love, that beautiful fantasy that makes us believe that we can change everything around us. We could also affirm a simple lie was the impulse — that uncontrollable desire to escape from the reality — that made Sofia left everything she knew to make a journey, to pursue her fantasy. However, Sofía did not find a Wonderland full of beauty, colour, and joy. She found suffering, violence, and a jail made of fear. 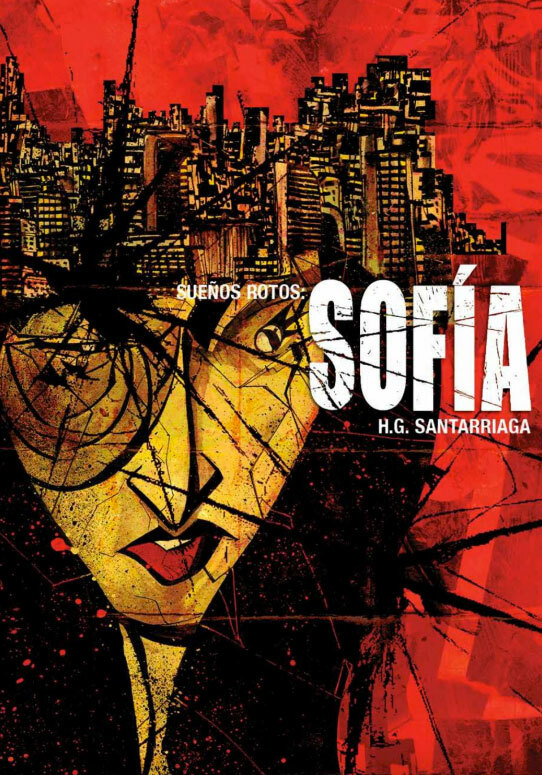 Sueños rotos: Sofía is the newest graphic novel by H.G. Santarriaga published by the independent publishing house Nostromo. H.G. Santarriaga is a Mexican comic artist well-known for his sci-fi stories and a visual style characterized by thick lines and a great use of contrast, specially between black and white. Through this work, Santarriaga expands his artistic path and explores new forms of expression. 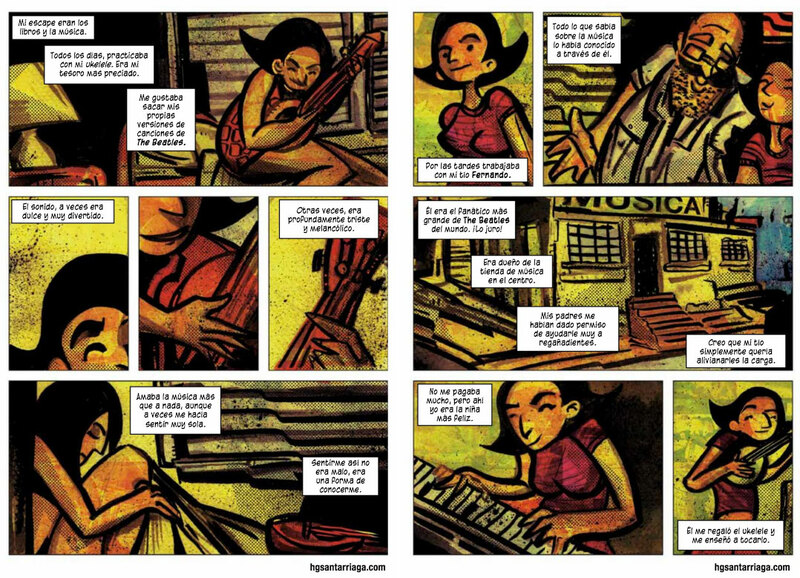 In this graphic novel, the artist explores a real problem, based on true stories and verified facts, in speaking about prostitution and human trafficking. After a research and the study of different true stories, the artist creates a fictional narration that tells more truth that the official media. Santarriaga, as a creator, is brave enough to give voice to all those women who are victims of abuse, violence and subjugation. Those women who remain in silence because of fear. Also, in this graphic novel, the artist takes the risk to develop his artist style distanced from his previous works to explore different ways to tell a story. By using different colours, specifically green and red, the artist invades the panels with one if these colours depending on what is happening in the story. Therefore, the colour becomes in a mechanism to express meaning. 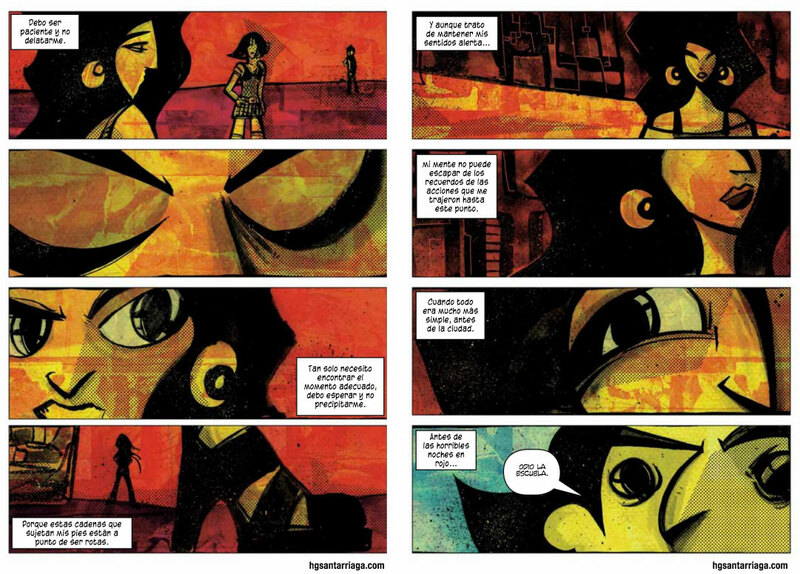 So, the colours become like a narrator that tells the reader what the feeling of the panel is. 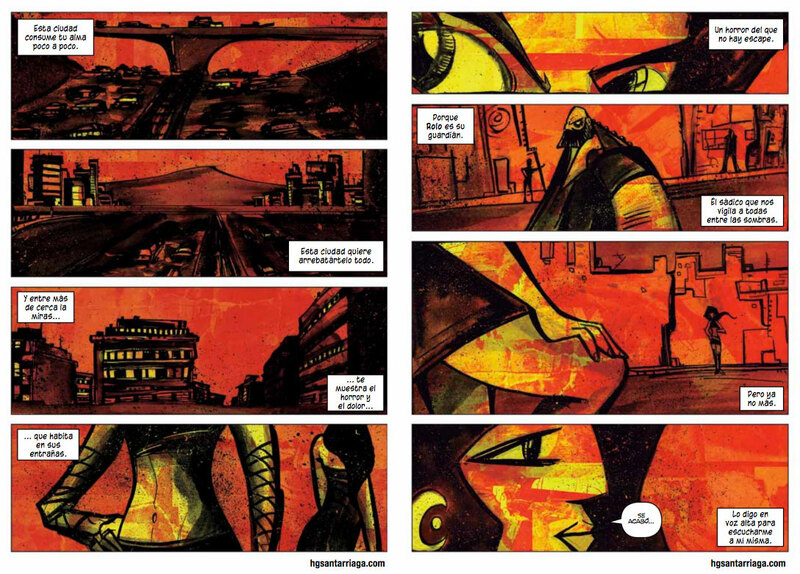 The colours also bring tension and singularity to every page, making this work a visual expression of a cruel reality. The colour red represents the decline, the downward spiral of violence and the brutal imposition of authority and the green, express innocence and happiness, those small pieces of joy lost in a sea of pain. 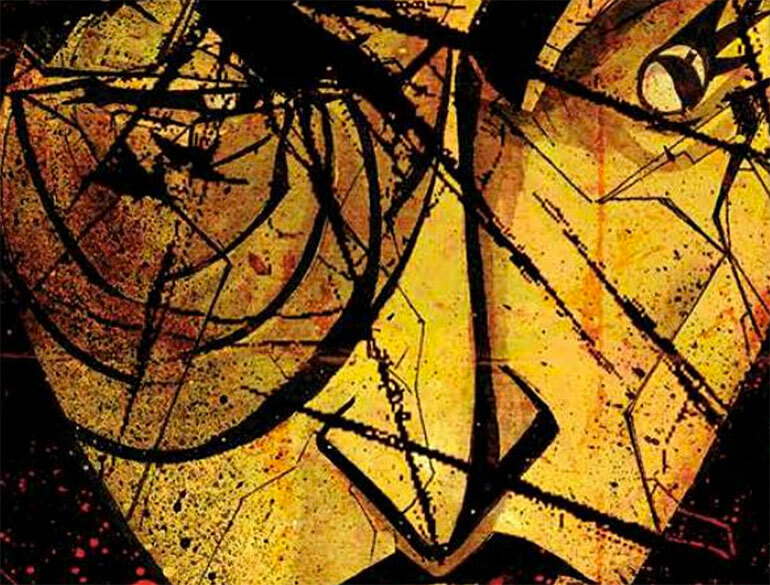 Through this story, Santarriaga makes us conscious of a situation that has been happening a long time ago in Mexico, but has not yet been solved. 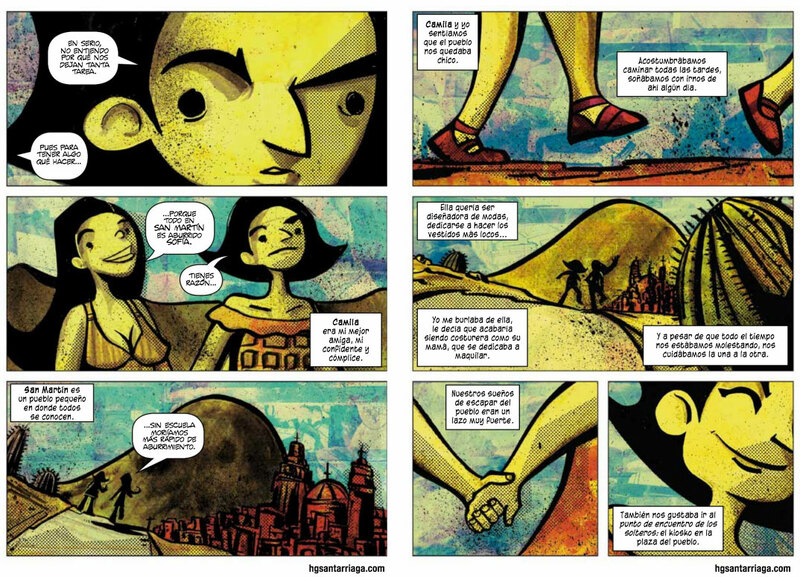 Sofía, the main character of this graphic novel, represents a 14-year-old girl who lives in a very small town, who fantasizes of a life full of excitement and away from the boring tranquillity of her hometown. It seems that her dreams will come true when she meets a hunter disguised as an adorable and attractive gentleman. But in a very short period, the illusion of happiness transforms into a scenario where she losses herself and is subdued by those who oppress through cruelty. Sofía represents one of many girls and women who fall into the intricate trap of trickery and become prisoners of terror, living on the precarious line where their life no longer belongs to them. In a place where nightmares become real, where not even the darkens can offer refuge, Sofía fights to survive, to not be consumed by that red city where she lives, that big red beast that is gradually consuming her. Sofía does not give up and she does not look down. She fights, she keeps trying, she keeps her eyes wide open. Making us believe that maybe, something can really change. That even the worst nightmares and the most solid chains can be broken by bravery.